Bardfilm: Shakespeare . . . Lost . . . in . . . Space! Shakespeare . . . Lost . . . in . . . Space! "The Space Creature." By Irwin Allen and William Welch. Perf. Guy Williams, June Lockhart, and Mark Goddard. Dir. Sobey Martin. Lost in Space. Season 3, episode 10. CBS. 15 November 1967. DVD. Twentieth-Century Fox, 2008. This was the first—and it may be the last—episode of Lost in Space that I've ever watched. My attention was called to it by the same reader who had found allusions to Shakespeare in Buffy, the Vampire Slayer. I don't have much to say beyond that—except to note that this is one more instance of the pervasiveness of Shakespeare in modern Western culture. Links: The Episode at IMDB. Wow. 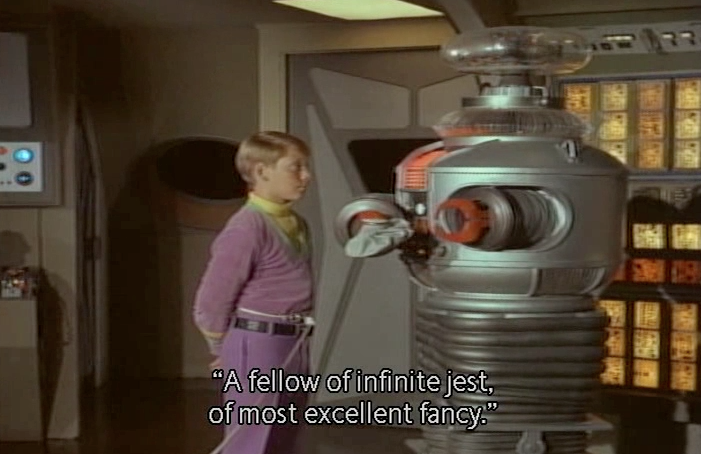 I have just watched a replay of the original Lost in Space series and was amazed to hear another quote from Shakespeare, courtesy of the robot "There's a special providence in the fall of a sparrow." It looks like that's Season 1, episode 13. I'll try to track it down. Thanks for the tip, DangerDanger! Actually, it seems like it's Season 1, episode 3 ("Island in the Sky"). Still working to track it down!